OUR TRAINING PROGRAM THAT IS AVAILABLE FOR YOUR PUPPY. How to know that you are NOT ready for a puppy! 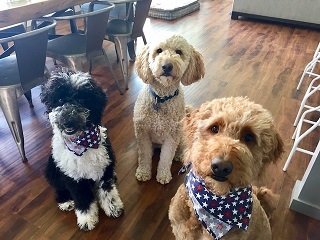 THE STUD DOGS : THE "BOYS" IN OUR DOODLE BREEDING PROGRAM. 8 WEEKS JUNE 10TH, A PERFECT TIME TO HAVE A PUPPY AND TRAIN YOUR NEW FRIEND OVER THE SUMMER... YOUR KIDS WOULD BE OFF SCHOOL TO HELP! 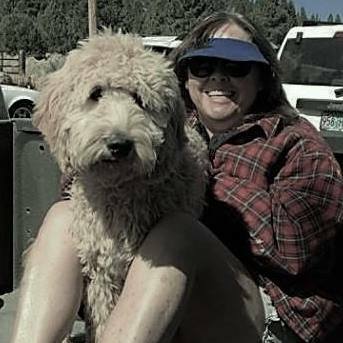 One of the many great things about Golden Doodles is their personality! You get the best parts of both the breeds. The Golden Retriever in them is always ready to have fun and party..while the more reserved Standard Poodle part is asking," should we wear a suit and tie" ? BELOW IS AN ADORABLE PHOTO OF THREE OF CRAZYWOMENKENNEL PUPPIES! 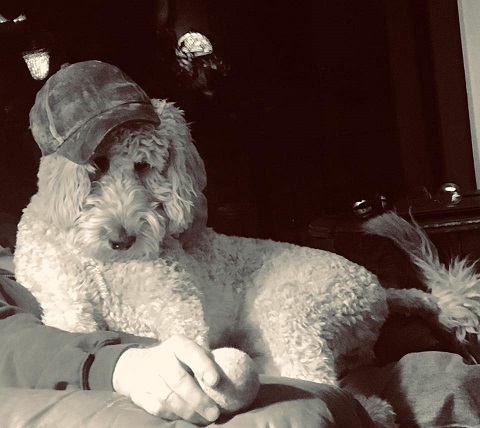 THIS PHOTO WAS SENT TO US FROM A FAMILY THAT HAVE, OVER THE YEARS, ADOPTED TWO OF OUR GOLDENDOODLES AND ONE OF OUR SHEEP A DOODLES. HAPPY, BEAUTIFUL , WELL LOVED DOODLES LIKE THESE BEAUTIFUL DOGS IS OUR GOAL HERE AT CRAZYWOMENKENNELS! PLEASE SCROLL DOWN TO THE BOTTOM OF THIS PAGE , AND ALSO BE SURE TO CLICK ON THE TABS ON YOUR RIGHT FOR PHOTOS AND INFORMATION ABOUT OUR PUPPIES. 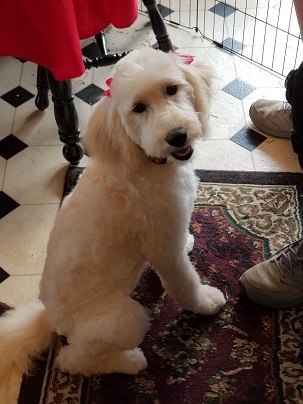 Below is Goldie, her "mom" took her in for her first big-girl haircut, Goldie is about 6 months old in this photo, she is a double doodle'. Golden Doodles are known to be loyal family dogs, they are people oriented and are happiest when allowed to live with their "family pack". Goldendoodles are tolerant with children, they enjoy interacting with other pets and dogs, and love going on adventures with their family. 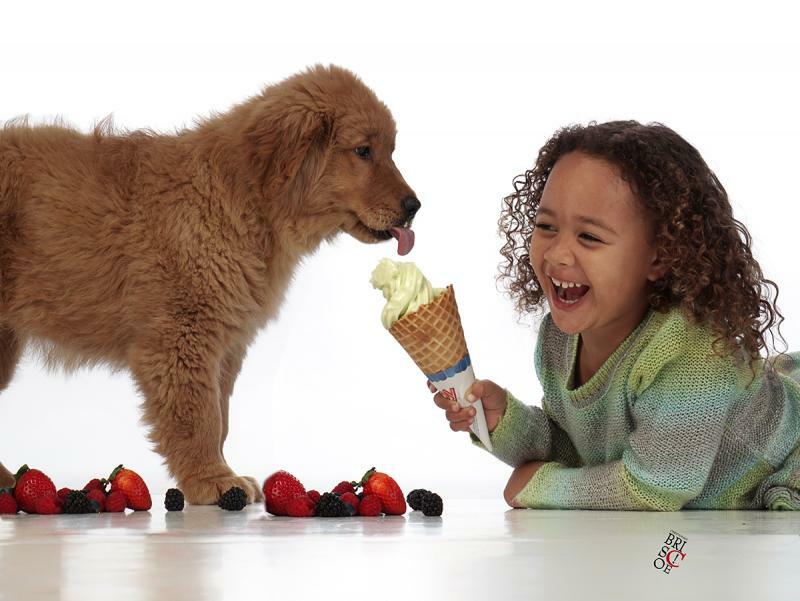 Doodles are very smart and kind dogs, many of our puppies have become service dogs for the disabled and comfort dogs for children and elderly. 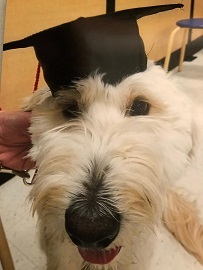 HERE IS A PHOTO OF EMMA, GRADUATING FROM HER ADVANCED PUPPY CLASS . below are photos that one of our clients was kind enough to send to me, (I LOVE getting pictures of "my" babies)! This goldendoodle boy ,McCulley , is shown in his natural coat, and then the next picture is of McCulley with a haircut. Quite a difference in the looks, Its all up to you how you want your doodle groomed! Below is a photo that was sent to me from a previous puppy purchaser, this doodle boy is seven months old, and well loved! BELOW IS WINSTON, ONE OF OUR BABIES , ENJOYING SUMMER AT HIS NEW HOME. 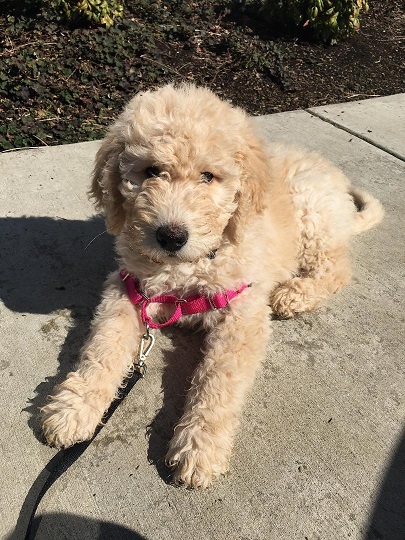 BELOW IS ONE OF OUR DOODLE PUPPIES THAT WE TRAINED . THE PUPPY IS ON A "SIT-STAY" COMMAND, ON LEASH WITH ONE OF OUR HANDLERS, READY TO BE TRANSFERED TO HER NEW OWNER. Crazy Women Kennels offers $100 off the purchase of any of our puppies to our Military and Veterans, First Responders, Police, EMT and Firefighters. LOOKING FOR THAT SPECIAL PUPPY? SHE'S WAITING FOR YOU RIGHT HERE AT CRAZY WOMEN KENNELS!! WELCOME TO OUR PUPPY SITE!! PLEASE TAKE THE TIME TO READ OUR "ABOUT OUR PUPPIES" PAGE, AND ALSO OUR "CONTACT US" PAGE. OUR "SHIPPING/DELIVERY OF YOUR PUPPY" PAGE IS VERY HELPFUL TO UNDERSTANDING THE AIR CARGO SHIPPING , PLEASE READ IT IF YOU ARE CONSIDERING HAVING YOUR PUPPY FLOWN TO YOU. aLL OF OUR PUPPIES ARE SOCIALIZED, HOME RAISED, AND COME WITH A WRITTEN HEALTH GUARANTEE SO YOU CAN FEEL COMFORTABLE IN CHOOSING A HEALTHY HAPPY NEW MEMBER OF YOUR FAMILY. We can ship your new puppy to you, WEATHER PERMITTING, please read our "shipping / DELIVERY OF your puppy" page for more information on this option.